Your local Meineke service center in Las Vegas NV is the best place to turn for all your vehicle maintenance needs—and by checking the Meineke online coupon page, you can potentially unlock savings. There’s no easier way to ensure that your auto air conditioning keeps doing its thing, and keeping your cabin cool! A convenient way to get your auto AC service completed is to request it at Meineke. Meineke’s service center in Las Vegas NV can perform AC checks along with other preventative maintenance, quickly and without hassle. Plus, you can visit the online coupon center to save a few bucks. This is the smartest way possible to invest in the longevity of your auto AC unit! Responsible car owners get their oil changed about twice a year. They get their tires rotated, as well. They might do this work themselves; more likely, they go to a service station like Meineke in Las Vegas NV. As you show diligence to these routine auto maintenance steps, don’t forget about your auto air conditioning. Your auto air conditioning works harder than you might think: It takes hot air and cools it, cleans out contaminants, and removes extra moisture. Through a multi-step process, it moves cool air from your refrigerant (Freon) to the vents, where you finally get to experience cool, refreshing air in your cabin. That’s a lot of hustle, so it’s no wonder your auto air conditioning needs some TLC from time to time. 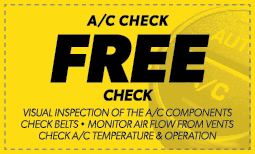 It’s quick and easy to schedule your AC check at Meineke in Las Vegas NV. Simply visit the Meineke website—and don’t forget to scan the coupon page for deals! At Meineke, you can make sure all your vehicle’s preventative maintenance needs are attended to, including any air conditioning repair work you might need.